Cybersys POS is a comprehensive, feature-rich point of sale system that can be implemented by a variety of small business types including retail stores, restaurants, coffee shops, jewelry shops, sports outlets, and more. It is a very flexible POS platform that can be customized to fit any business environment and address particular business needs and specifications. Cybersys POS comes with a vast selection of high-quality hardware to complement its robust software, such as receipt printers, cash drawers, credit card readers, barcode scanners, and label printers among others. Initially a custom POS intended for a small fragrance store, Cybersys POS became a huge hit for small businesses that are looking for a point of sale system that delivers all the goods and provides a wide range of flexibility without the heavy price tag of conventional POS. Cybersys POS is a very complete POS platform that doesn’t break the bank. You can expect a very feature-rich POS that is equipped with all the standard tools and features you expect in a conventional POS system, such as inventory management, e-commerce integration, employee access management, reporting, delivery management, coupons and promotions, purchase orders, and payments to name a few. You can get all these at a budget-friendly rate, saving you precious money that you can use on other business priorities. 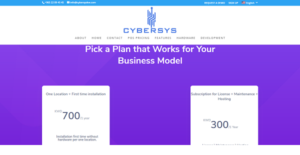 You can get in touch with Cybersys POS developers and create custom plans for your business. Build a package that has all the tools and features you need and hardware that covers all the bases for a price that fits your budget. With Cybersys POS, you never have to pay for tools and equipment that you have no use for. Cybersys POS runs on all devices and platforms, even on smartphones and tablets. This allows you to take your business wherever it needs to be, be it trade fairs, corporate seminars, or sporting events. Mobile card readers, mobile apps, centralized and synchronized system help you do business wherever, whenever. Nothing’s stopping you to sell at any location and grow your business to exponential levels. What Problems Will Cybersys POS Solve? Cybersys POS offers a robust user experience: slick interface, excellent sales, and inventory tracking, and intuitive ease of use. Training employees to use the software took practically no time. Customers love the account features that allows history searches and store credit lines. This product does everything a small brick and mortar store needs. It handles them well. Every enterprise has its own characteristics, and may need a special POS Software solution that will be adjusted to their business size, type of customers and employees and even individual niche they support. It's not wise to count on getting an ideal solution that is going to work for every company regardless of their history is. It may be a good idea to read a few Cybersys POS reviews first and even then you should pay attention to what the service is supposed to do for your company and your workers. Do you need an easy and straightforward service with only elementary features? Will you really use the complex functionalities needed by experts and big enterprises? Are there any specific tools that are especially practical for the industry you operate in? If you ask yourself these questions it is going to be much easier to get a reliable service that will fit your budget. How Much Does Cybersys POS Cost? We realize that when you make a decision to buy POS Software it’s important not only to see how experts evaluate it in their reviews, but also to find out if the real people and companies that buy it are actually satisfied with the product. That’s why we’ve created our behavior-based Customer Satisfaction Algorithm™ that gathers customer reviews, comments and Cybersys POS reviews across a wide range of social media sites. The data is then presented in an easy to digest form showing how many people had positive and negative experience with Cybersys POS. With that information at hand you should be equipped to make an informed buying decision that you won’t regret. What are Cybersys POS pricing details? What integrations are available for Cybersys POS? Cybersys POS has an API for custom development with Cybersys POS. This allows for extensive customizations and workflows and you can hook it up to almost any third party product. If you need more information about Cybersys POS or you simply have a question let us know what you need and we’ll forward your request directly to the vendor.